I recently wrapped up illustrations for a children’s book about Santa’s dog. It’s called Santa’s Dog. More about the book when we approach Christmas. You can catch a peek at the cover on my FB page https://www.facebook.com/EdKoehlerIllustrator/. 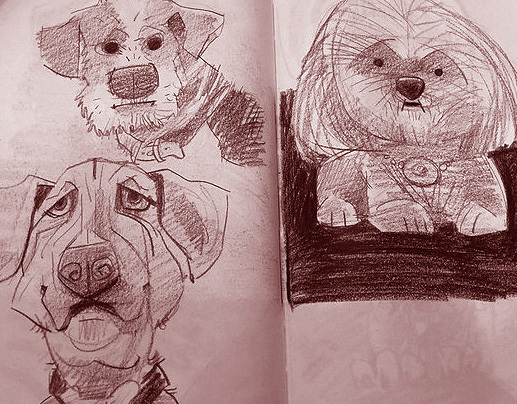 Right now I want to talk about dogs, sketching them, and developing a whimsical persona for our canine friends. Agreeing to do the book, I went into concepts and sketching. 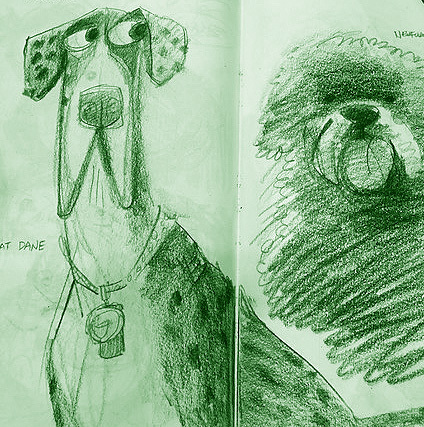 The hero of our book is a specific breed, but to develop the character, I sketched all kinds of real, semi-real, and entirely unreal dogs. These drawings, taken from one of my sketchbooks, share the process. 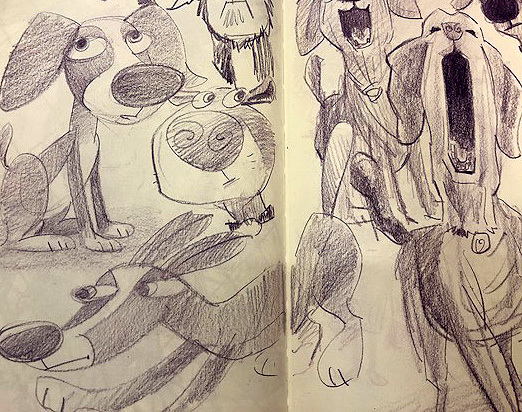 Loose, scribbly, fast and fun: that’s the way of the sketchbook. This isn’t the place to get bogged down. A sketchbook is a safety zone for mental and experimental fun. This was fun work because dogs are fun. I’ll concede not all dogs are fun. Some have issues and can be quite scary. My personal experience with dogs has been about 99.8% fun. I was once bruised by the nose of an aggressive German Shepherd, snipped a few times by some skittish little beast, but mostly my dog times have been good times. Dogs are simply funny. They look funny, walk funny, wag funny, talk funny, and even sleep funny. We had a dog named Laddie, which was a misnomer, by the way. We inherited Laddie from Judy’s aunt. Aunt Martha named the dog Laddie under the assumption he was largely Scottish Terrier. He was nothing Scottish Terrier, but cited by a vet as likely a Schnauzer and Dachshund mix. Or, as we would say, Schnauzer und Dachshund, which we designated a Schnachshund. His most endearing trait was that he fancied himself a shepherd dog. Each night around 9:00 Laddie would stand before Judy, stare into her eyes, and express a low, non-menacing growl. It wasn’t in anger; he was ordering her to bed. Laddie lived with Judy’s widowed aunt, who lived with a widowed friend who was Laddie’s adoptive mother. Laddie slept with his human mom, and so we discerned that his herding Judy off to bed was simply his way of saying “lights out”. Laddie slept in a doggy bed beneath our window. He fully expected Judy (I didn’t matter) to go to bed when he did. Canine Whimsy. It is no mystery that cartoonists, animators, and kitsch artists, have cashed in on the dog. Yes, cats have been equally depicted, but most cartoon cats are a pain. Snoopy verses Garfield? No contest (no offense). My earliest cartoon dog memory is Tom Terrific and Mighty Manfred the Wonder Dog. I loved that fluffy goof. Tom would have been terrific all by himself because he wore a funnel for a hat, but Manfred was icing on the cake. He slept on his back, all four legs pointing upward. I preferred Ruff to Ready, Snoopy to TopCat, and Huckleberry Hound over Sylvester. I do give Sylvester a high rating however, because to me he was a dog in cat’s clothing. Judy and I alert each other when we spot a great dog. Recently, with our unusually moderate weather, we’ve been enjoying breakfast on our screened porch while reading and discussing a Psalm from our Pastor Clay’s sermon series. We live in a dog friendly subdivision. During breakfast a goodly number of dogs walk their humans past our porch, and we often engage. This past week we met a Jack Russell Terrier named Tony, and played with a neighborly Wheaton Terrier named Mason. Mason is what Judy and I call a cartoon dog. His square cut muzzle, over-sized fluffy feet, and place jumping (flat footed to ten inches off the ground in .02 seconds) skills are living cartoonery. These clips from my sketchbook show the preliminary steps I take to capture a character. Santa’s Dog looks nothing like these pencil roughs, but where he arrived to came from here. Below is the second page of author JoAnn Sky’s delightful book, Santa’s Dog, which should be on the shelves around mid-August. 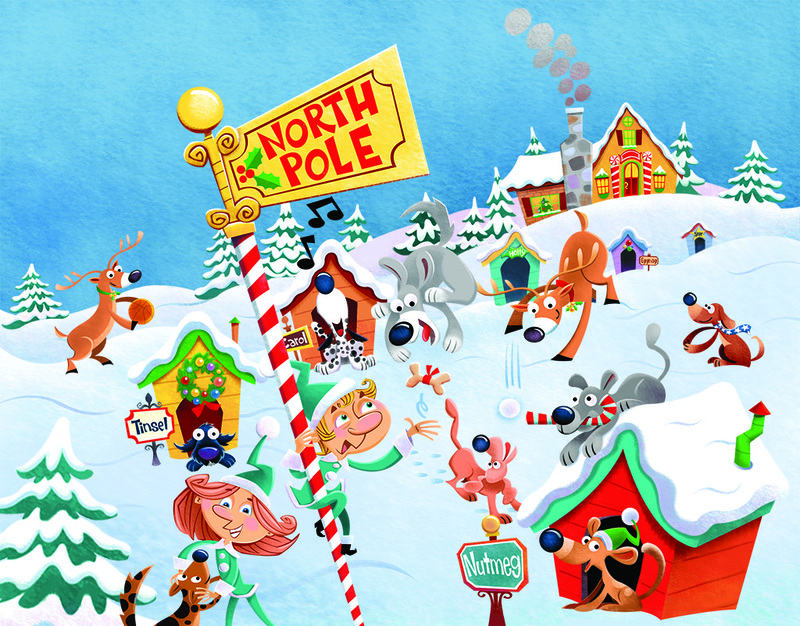 The hero dog, Lance, isn’t on this page, this is just a sampling of my canine citizens of the North Pole. I hope my dogs bring as much delight to a kid as Mighty Manfred, Snoopy, Ruff, Huckleberry, Underdog, Scooby Doo, and many other cartoon dogs did for me.